The mission of JesusHacks is to help you live like Jesus in everyday life. At the heart of living like Jesus is stewardship. This is part 2 of a 3 part series on Stewardship. Think of this as a crash course on the foundational truths that form the framework God has created for us to live and thrive in. If you missed part 1 click here: The Skill of Stewardship. As a quick recap, Stewardship is built on 2 big ideas. You are not your own but belong to God meaning that everything you are and have is a gift from the creator God to be used wisely and intentionally. You are called to take biblical responsibility to properly use the energy, time, gifts, abilities, and possessions the Master has given you to steward. To be successful, the world says you need to love yourself, you need to esteem yourself, you need to choose yourself. To be happy, ensure you get “me time” and always make sure to follow your heart. But this is a cheap counterfeit of biblical, godly and wise stewardship. Loving yourself is a very popular and appealing idea in our culture today and even in the modern church. But no matter how popular or appealing the idea of self-love may be, this idea falls short of what Jesus teaches us. The countercultural biblical alternative to the world’s call for self-love is far more satisfying and motivating than anything we could possess or promote by turning internally and seeking the answers within ourselves, designing our own destinies, being our own hero, or creating our own vision for life. The countercultural biblical alternative to self-love is self-stewardship. Properly governing and developing “self” in a Jesus-centric way is the first responsibility a good steward must learn. All Jesus followers must approach the area of “self-care,” personal growth, and “all things practical” in this way. Self-stewardship is essentially stewarding our body, soul, spirit, mind, heart, conscience, will, emotions, energy, time, gifts, abilities and possessions; basically all that you are and have in everyday life under the authority, agenda and advancement of Jesus and His mission. Because as Jesus followers we are not our own but belong to God, we must do all that we do with the mindset of stewardship, beginning with our first responsibility: ourselves. This is not selfish or inward focused. It is responsible and ultimately results in outward focus. This is not narcissistic, but biblically necessary. This is not primarily for your gain but for God’s glory. The joy, happiness, blessings, benefits, outcomes and rewards are secondary and a byproduct of that primary purpose of stewarding what is God’s for His glory and purposes. So we steward our body, heart, soul, spirit, mind, conscience, will, emotions, energy, time, gifts, abilities and possessions for the glory of God and the service of others. As Christians, we follow a guy who said, “If anyone wants to follow Me, let him deny himself and take up his cross (instrument of death) daily.”1 This means that the idea of self-love, self-care, or self-anything is always a tough one to think through. It’s tough because we know there’s an aspect of self-governance, self-development and self-control that the Bible does call us to, but often we try to do this “aspect” of life in the world’s way, using the world’s philosophies, motivations and definitions of success. But Jesus doesn’t just command us to die for the sake of death. He follows up His commandment of self-denial and cross-bearing self-death with this statement: “For whoever wants to save his life will lose it, but whoever loses his life for me will save it.”3 Jesus calls us to love ourselves enough to deny ourselves, die to ourselves, and live life as it’s meant to be lived: with Jesus as the Captain our life and the Master of our destiny. Although the call of self-denial and cross-bearing is tough and fundamentally impossible for us to do without the Spirit’s indwelling power, the reward found in Jesus and in the eternal life He gives us is incomparable. Not only in the ultimate eternal future sense, but also in the immediate present sense. Jesus doesn’t call us to death for the sake of death but for the sake of life. There are many ways in which the Scriptures call us to what I’m calling “self-stewardship.” We receive instructions to “Keep our heart with all diligence, for out of it spring the issues of life”4; to “Ponder the path of [our] feet, and let all [our] ways be established”5; and to “Build [ourselves] up in [our] most holy faith”6 by “making every effort”7 to develop our faith and “train [ourselves] for godliness.”8 These are just a few of the examples from which I’ve developed the biblical principle I call self-stewardship. The command to pursue by faith and diligent effort the qualities of the Divine nature through the power of the Holy Spirit are clearly taught and assumed all over the biblical text. In addition to these instructions throughout the Scriptures, we are given various illustrations and metaphors for how the Christian life is supposed to look and function. I call these biblical paradigms for self-stewardship. There are essentially 4 key paradigms or models used in the scripture to illustrate how self-stewardship is to be practically implemented; the athlete (1 Corinthians 9:25-26; 2 Timothy 2:5), the soldier (2 Timothy 2:3-4), the farmer (Galatians 6:7-8; James 5:7; 2 Timothy 2:6), and the builder (1 Corinthians 3:9-12; 1 Peter 2:4-5). These biblical paradigms give metaphorical color to how God expects us to take responsibility for what He’s called us to do while absolutely entrusting our lives to His ultimate will in all things. It is in this way that we operate as little “d” designers, as little “c” creators, as little “m” masters without usurping God’s place of big “D,” big “C,” and big “M” in our lives. In part 1 of this series I wrote about becoming a good steward. This is where it all begins. Good stewardship begins with stewarding you and then works its way out from there. You don’t meet many people who’s dream and ambition is to drift through life and do nothing of value or importance. If you have, they likely won’t stay there and if they do, they need help because it isn’t going to end well. Humans are wired to want to live meaningful, significant lives. Nobody wants to waste their life, at least on purpose. We were created to have ambition and passion for living life well, for being intentional, effective, productive, and impactful. We were made to grow and develop. We were made to want to discover and learn. We were made to live a life that matters. And so we fear and try to avoid wasting time and opportunities like a disease. The problem is we tend to aim to solve this desire in all the wrong ways. The good news is Jesus changes all that. We no longer have to be slaves to ourselves, but instead we can deny ourselves, take up our cross and follow Him. In doing so, we become sons and daughters of God and stewards of His good gifts for His purposes in the world. This is what we were made for. This is what we are redeemed for. Becoming difference-makers will only happen when we allow Jesus to make us different from the inside out. And herein lies an important truth: Jesus often works from the inside out. He changes the world by totally transforming individuals, training them to take their proper stewardship positions, and using them together as a group, His people, to bring the gospel of the Kingdom and do good works in the world just like He did. This is where true stewardship begins and ends. This is where living like Jesus begins and ends. 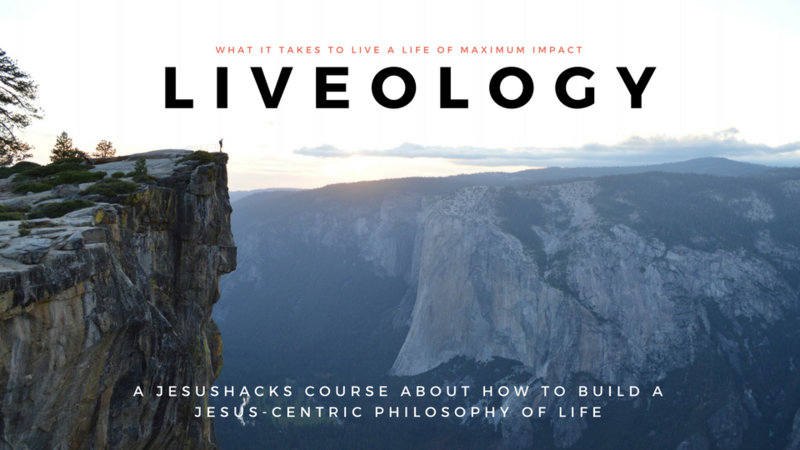 This is where the mission of JesusHacks begins and ends: to help you live like Jesus in everyday life and in doing so, impact the world around you. And this is where self-stewardship finds its place and context in God’s framework for life. Impact and change always starts with each of us individually first. If we aren’t willing to allow Truth to impact and change us, how can we think the Truth will impact and change anybody through us? Jesus works from the inside out in all levels of human existence. To change the human, He changes the heart. To change the church, he changes the individual. To change the world, He changes His people, the church. The desire for impact we have will only become a reality when we choose to let God be the master of our destiny. When we choose to let Jesus be the hero of our story. When we choose to take the servant position and steward what is ultimately God’s anyway – our whole selves. If a man or woman can’t steward themselves well, how can they help others do so? How can they practically or spiritually serve a spouse if they can’t even practically or spiritually steward themselves? How can they serve and lead the hearts of their children if they can’t lead their own hearts? How can they properly serve in the church if they can’t ultimately serve their own family? On and on we could go. Those who can’t steward themselves cannot be trusted to steward anything else – spouse, family, church, community, government or otherwise. The challenge for each of us is to be the kind of self-stewards who remain good stewards and never be deceived into seizing again the Captain’s throne of our lives and putting our “SELF” there instead of Jesus. Self-stewardship is built on 5 Big Ideas. We are created to be stewards and it is through stewardship that we experience true life and joy in God. We cannot be our own masters. Self-stewardship is the biblical alternative to the world’s call for self-love. Good stewardship, beginning with godly self-stewardship, can only take place through self-denial, self-death and allow Jesus to take command as Captain of our lives. Self-stewardship is primarily about letting Jesus change us from the inside out by listening to God through His Word and talking with God through prayer in order to be individually impacted by Truth so that we can make an impact with that truth. It is necessary to take the responsibility Jesus has clearly called us to take as good stewards in order to achieve what Jesus has called me to. We cannot be passive. God has given us a tremendous amount of capital to steward well for his Kingdom. Let’s commit to godly Self-Stewardship for the glory of God and the good of others. Does this perspective on Self-Stewardship help you in your pursuit of an Intentional Life? Share your Responses, Thoughts, and Ideas in the Comments!